I've used a Therm-a-Rest Ultralite 3/4 on backpacking trips for at least 15 years, but the world has moved on and new products have become available. The Ultralite no longer keeps me warm enough when camping in winter and I have increasingly found myself waking up cold during the night, although I do like the small packed size and light weight. The Holy Grail of sleeping mats is that it is lightweight, durable and above all, in winter conditions, warm. Unfortunately for the T-a-R NeoAir, numerous forum and blog reports about leaking valves and overnight deflation put me off buying one, although the early problems with the Neo may well have been resolved by now. I settled on the Exped Downmat 7 Short with integral pump. It's an interesting concept as a sleeping mat and completely different from the self-inflating foam core construction of the T-a-R range and various clones. The mat is filled with goose down which is held in place by internal baffles. It promises warmth! Out of the packaging, the Downmat comes with a repair kit consisting of a tube of adhesive and patches. 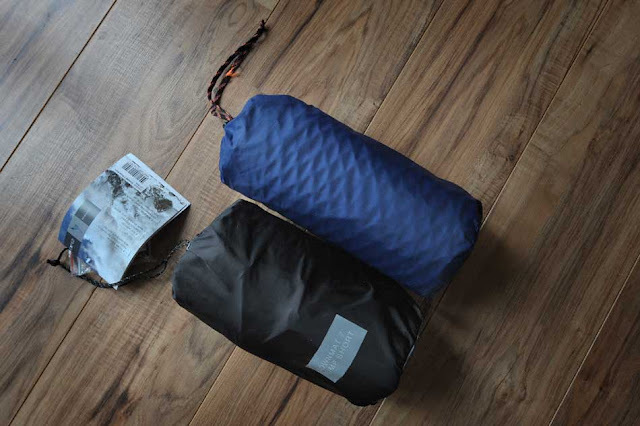 Shown below in it's black stuff sack alongside the Ultralite for comparison, the Downmat packs smaller than the Ultralite by 2-3cm. The Ultralite weighs in at 490 grammes and the Downmat is 620 grammes on my kitchen scales. 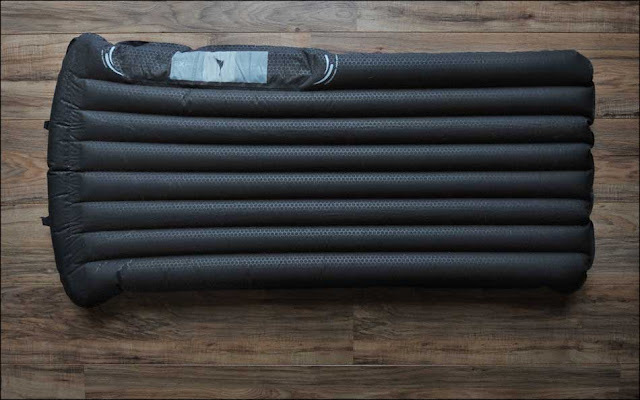 Side by side comparison with the Ultralite reveals that the Downmat is a similar length, but is wider by around 10cm whilst deflated. The pump is on the underside. Open the valve, cup the left hand over the valve and press down with both hands as per the diagram printed on the mat. The self-inflating foam inside the pump forces air through the one way valve and the mat inflates in around a minute. It's much easier than I expected and the system works reasonably efficiently. The dump valve for releasing air is at the top of the mat. The pump does require some force to operate properly, so this system is probably not to be recommended for people with weak or injured wrists and other hand/arm problems. Sleeping side up, the mat quickly takes shape. The side profile is considerably deeper that the Ultralite and it is warmer and far more comfortable to lie on. 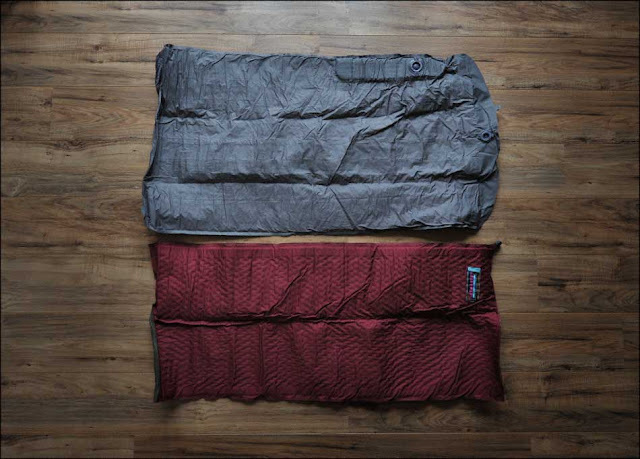 When inflated, the Term-a-Rest Ultralite and the Exped Downmat 7 are equal in width. That extra 130g is a price well worth paying for the increased comfort and warmth that the Downmat offers. 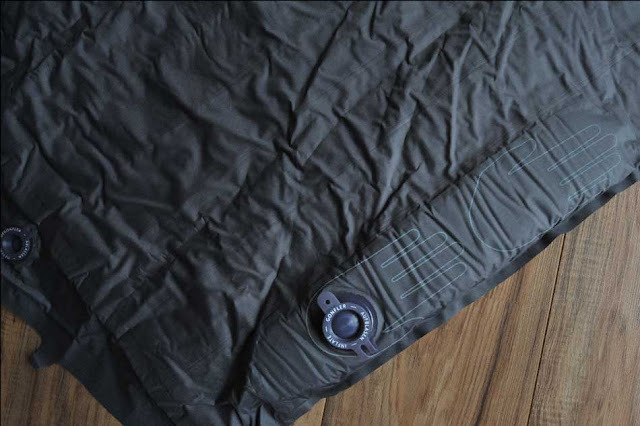 The new Exped Downmat 7 Short is as good as it currently gets in lightweight sleeping mats. Great mats. I'm sure you'll be very happy together. Had the downmat 7 for a few years now and am very impressed. Toasty warm and boxspring comfortable. In use, can't be beaten as a winter mat I feel. Mine lacks the internal pump. Inflating the thing with teh stuff sack is a bind. I think the internal pump is likely to be a great improvment. Thanks, Dave. The pump works quite well and the Downmat is much warmer than the old Ultralite. Can't knock the T-a-R too much though. It's served me well for over a decade and a half without a problem and still has years of use left in it. There was a time when that mat was the one to have! I like your floorboards, very nice colour. Parquet? Ah ja, the Downmat 7 also looks superb. Any reason you got the short version instead of the regular version? I got the short version because of the small packed size and weight. I've never used a full length mat since the days of my old yellow closed-cell Karrimat. That was a long time ago! If I need more insulation under my legs, it's the Mountain Equipment duvet and/or my back pack. I like it. Sleep warm and comfy. For only a few grams more. Sounds good to me. It's long past time, Martin. Old bones and all that! On the pics it looks like you haven't equalized the pressure between the pump and the rest of the mat. I didn't know you could do this when I first used mine, and it gets a bit uncomfrtable if you end up lying on the non-equalized pump area. All you have to do after having closed all valves (including the pump one) is to, with your hand, locate the inside valve between the pump and the main mat body. Then squeeze this valve between your fingers to make it open and, voila, some air will seep back from the main compartment into the pump area making the whole of the mat nice and puffy. Makes for warm and comfy nights. Thanks, Karl. You are correct! I have to try mats. I have an old "rug" of isoprene which needs to be replaced. I winter I place pine branches underneath it. Great work thanks much.. Just in time it will not be too long before hiking season here in Alabama! Great review, thank you. Have linked it into a post I am writing about winter kit, so thanks for the detailed analysis and great photos.